Nashville Airport, also known as Nashville International Airport or BNA, is the main airport for the super city of Nashville in the state of Tennessee. With a rich history dating back many decades, Nashville Airport is an interesting place to fly from and has been ranked and classed by experts and casual travelers alike as a good airport to choose, especially for travel around the United States. As well as offering flights all around the US, Nashville Airport also provides flights to locations like Europe, Canada, Central America, and the Caribbean. It features an enormous passenger terminal that measures up at over a million square feet and handles over 15 million passengers per year. With all those passengers passing through, there can be a lot of people waiting around feeling hungry and thirsty at any one time at Nashville Airport. This is why the airport has been equipped with an impressive array of restaurants and other eateries. There's a lot of variety in terms of places to eat at Nashville Airport, with a lot of good sit-down locations, fast food joints, and cafes in and around this location. Read on to learn full details on a few of the very best restaurants at Nashville Airport. You can find restaurants and eateries all around Nashville Airport at any of the concourses. Read on for brief descriptions of some of the top places to eat at this airport, complete with info on where you can actually find them. Over on Concourse A, not far from Gate A3, La Hacienda Mexican Restaurant is one of the top Mexican dining locations at Nashville Airport. You'll find all the classic Mexican dishes here, and if you've spent a little time in Nashville, you might be quite familiar with the La Hacienda Mexican Restaurant menu as they actually have a few locations all around the city. 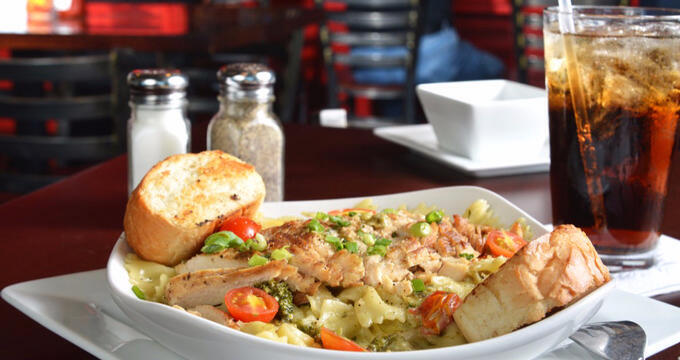 O'Charley's is an Irish bar and casual dining spot that has been very popular with Nashville locals for many years. The brand is headquartered in Nashville and has this location right in the heart of Nashville Airport at Gate C9 in Concourse C. You'll find some simple burgers, sandwiches, and more refined dishes at this location, with a lot of healthy options for those who are counting calories or being careful about what they eat. There's a large Food Court over in Concourse C and that's where you'll be able to find Famous Famiglia. It's open from 9 in the mornings until late in the evenings on most days and is one of the top pizza joints in Nashville Airport. Pizzas are the main stars of the menu here, with a huge range of great toppings and options to choose from, but you can also order subs, salads, calzones, and a few different types of pasta too. Over by Gate C2 you can find Berry Field Bistro, which offers something a little different to the many fast food joints and national chains present in most airports. This place is all about the quality, focusing on farm-to-table ingredients and local produce. Almost everything here is made with ingredients found in Tennessee, guaranteeing a great degree of freshness in every dish, and the menu is very varied and interesting, offering everything from cheese platters to veggie wraps and roast beef sandwiches. Over by Gate C20 is where you'll find Gibson Café. Nashville is nicknamed Music City, after all, and a lot of people visit this city each year to soak up some of the musical culture and history that has helped to make Nashville such a special place, so what better place to dine than at a cafe dedicated to one of the most famous guitar brands of all time? You'll find a lot of great Gibson guitars and memorabilia decorating the walls of this location, along with some super sandwiches, burgers, and sharing platters, plus a lot of great beers and other drinks. Over by the large food court on Concourse C is where you can find Hissho Sushi. Open from early in the morning until late at night, this place is the number one stop for anyone in need of a sushi fix at Nashville Airport. You can see the chefs hard at work in the kitchen of this location and there's a great range of sushi to choose from. The prices are quite competitive too and there are some other Asian dishes to check out if you're not in the mood for sushi.